Are you allergic to lemons? Question: How can I know if I am allergic to lemons? Nancy’s Answer: Lemon allergies are uncommon, but like any citrus allergy, a lemon allergy can cause a variety of uncomfortable symptoms. 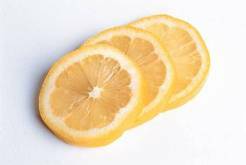 If you know you have an allergic reaction to any type of citrus fruit, there is a good chance you might have a reaction to lemons. A lemon allergy can develop at any point during one’s life and can also subside at any time. Our immune system uses antibodies to fight off foreign invaders such as bacteria and viruses. A lemon allergy is caused by the release of IgE antibodies in the body. For some reason, the body identifies the lemon proteins as harmful invaders, thus causing a chain of chemical reactions and production of histamine. A simple way to determine if you might be allergic to lemons it to touch a small amount of lemon peel or lemon pulp to your skin and see if you have any type of reaction, such as a rash or itching. This is obviously not a foolproof method, but if you are allergic, there is a good chance you will have some type of reaction. If in doubt, an allergist can help determine if you do, in fact, have a lemon allergy and what might the cause. Common diagnostic tests may include a skin prick test or blood test.